CWA members continue to bargain with Nokia, and have agreed to a one-month extension of the current collective bargaining agreement. The company has not backed down on their sole proposal in bargaining which would eliminate its union workforce, one of the oldest bargaining units in CWA. The unit has more than 100 years of history originally as Western Electric, then AT&T Technologies, Lucent Technologies, Alcatel-Lucent, and now Nokia. Nokia wants to move the work to a third-party service provider model that will cause hundreds of U.S. workers to lose their jobs. Future work would be subcontracted and, in some cases, handled abroad. This week, UNI Global Union, a global union federation representing 20 million members in more than 150 different countries, expressed their support for the Nokia workers, calling on Nokia to bargain with the CWA in good faith. Click here to send an online letter to Nokia CEO Rajeev Suri and Nokia Bargaining Chair Steve Muscat urging Nokia not to eliminate American jobs and benefits, to bargain in good faith with the union for a fair deal that allows Nokia to invest in the U.S., to keep its long-standing installer workforce, and to maintain the quality of service and our telecommunications infrastructure for U.S. customers. In the face of AT&T's unwillingness to make serious progress toward keeping good jobs with family-supporting wages and benefits in their communities, the CWA bargaining committees for AT&T Midwest and AT&T Legacy T have gone home to their respective locations to ramp up mobilizations and are working to increase political and public pressure on AT&T to bargain fair contracts. CWA members and retirees can show their support by signing a petition to AT&T CEO Randall Stephenson at www.GoodJobsATT.org and sharing it with their friends. Top photo: Members of CWA Local 4340 at the Chatfield garage in Cleveland are standing strong for a fair contract at AT&T Midwest. 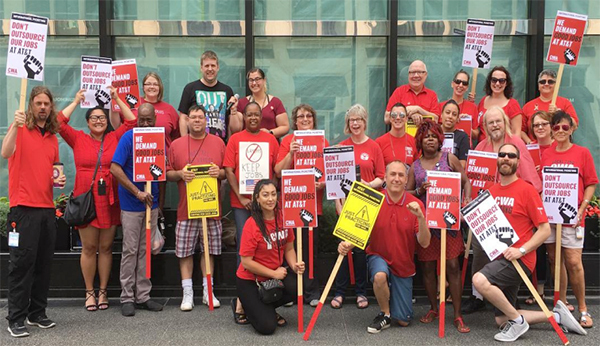 Bottom photo: Members of CWA Locals 7200 and 7250 at AT&T Legacy T have been holding weekly rallies together in Minneapolis to show AT&T that they're ready to fight for a fair contract. Workers are continuing to fight for American Airlines to pay its employees living wages at subsidiaries Envoy Air and Piedmont Airlines. 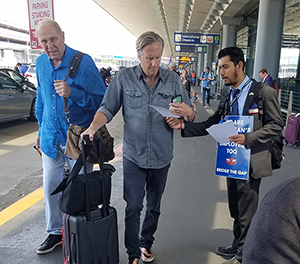 This week, more than 100 workers around the country leafleted at nine different airports to build public awareness and support for the fair contract fights at Envoy and Piedmont by asking passengers to sign the petition to end poverty pay at American Airlines at www.American-Poverty.org.